Digital signage is a great way to communicate information for various applications such as advertising, brand building, delivering news and public information as to enhance your customers' experience. 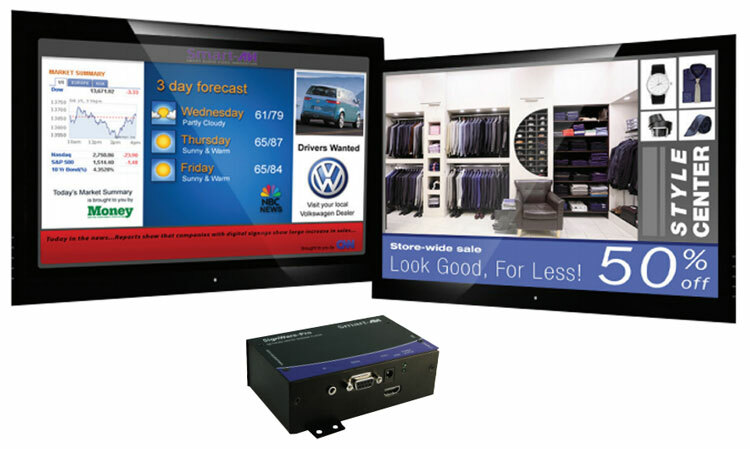 Digital Signage is becoming an ever popular solution to providing appealing, dynamic messaging to customers. In retail applications, digital signage provides compelling, site-appropriate content directly to customers who are already looking to buy. Digital signage also excels at brand building by providing an engaging platform to launch new products and increase brand recognition. 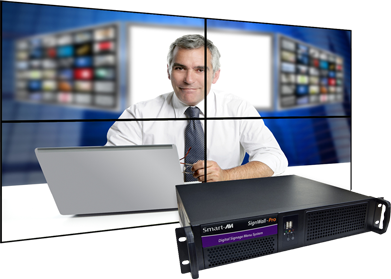 To have an effective digital signage setup you will need to create network infrastructure wherever the display, media player and content server are in separate locations. Often the signal is transmitted over CAT5 or even fiber optic cables using a transmitter and a receiver. Our extensive selection of extenders and digital signage hardware will help you create a dynamic and user-friendly environment with digital signage. The most reported challenge with media, broadcast and post consumers is how to achieve quick, easy extended access to key business applications, enabling collaboration, and increased employee workflow productivity. How to reduce computer heat and noise in the suite? How to securely maintain and manage a single or multiple point access of server�s storage? How night staff can access and control our day staff production equipment? What systems are flexible and provide on-site administration to one screen at any particular point? How to extend production access across multiple buildings? How to achieve scalable, High Definition, dual monitor, matrix extension solution? Where KVM solutions fit into your modern broadcast and media facilities: KVM technologies have formed an integral part of media facilities allowing media professionals to locate computers remotely from production environments, edit suites, and control rooms. Furthermore, KVM has always improved operational workflow by allowing multiple computer use by a single or multiple operators. Modern broadcasting environments need more from their KVM than to simply extend and switch. Today�s media professionals wish to continue to remain agile and competitive with ways to reconfigure an infrastructure and have a greater level of flexibility. 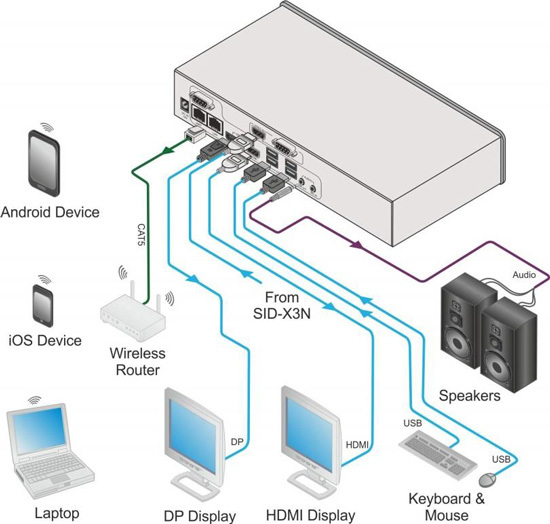 KVM Matrix technology provided by KVM Switches Online allows multiple users to access multiple computers over long distances. Studios and Production Environments: Studio environments many times are rapidly changing spaces with evolving needs for audio video. From one production project to the next, the studio may need to change routing and re-routing of AV, adding and removing screens and interfaces according to need, multicasting content around the space with absolute reliability and pristine video quality. High Performance KVM extension provides solutions to these needs and is perfectly replicable from a library of user defined preset configurations using its Matrix technology. Post Production for Film and TV: Post facilities located globally function as the powerhouse of independent productions, studios and broadcasters alike. In the edit suite, the media professional is focused on crafting a viewing experience, taking into account: story, color grading and ensuring sound and audio incorporate the viewers� imagination into the productions directional path. This flow can be a challenge when collaborating with your production division at a different location in the building. With High Performance KVM this challenge is solved at the press of a button, allowing access across multiple buildings or floors, and allowing teams to work together securely and maintaining a single point of storage.